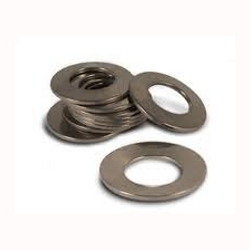 Our range of services include belleville washers. Belleville Washers is for maximum load build up with minimum washer deflection compared to a bowed washer. They provide high loads in small spaces. Stacked in nested multiples disc (Belleville) washers provide extreme load build up. Stacked in inverted pairs disc (Belleville) washers provide maximum washer deflection (flexibility) and less load build up. These are materials we stock in various thicknesses. It does not mean we have finished inventory of all washers in each of these materials. Non stock alternate materials that are commonly run are Phosphor Bronze to ASTM#B103, and 17-7 Stainless Steel. Customer specific materials different than those listed above are commonly run. We are service provider only in Maharashtra, Gujarat and Karnataka. Looking for Belleville Washers ?